During the first half of the twentieth century, the legendary steam engines of the Great Northern Railroad ruled the American northwest from Seattle, Washington, to St. Paul, Minnesota. Riding the Empire Builder was the safest, fastest, and most comfortable way to travel, as it chugged over wide rivers, across the Great Plains, and through snowbound mountain passes with such regularity you could set your watch by it. But for a small girl travelling by herself for the first time, a trip from her country home to visit Grandma in the city of St.Paul is anything but routine. 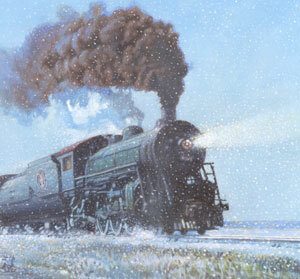 With words rich in the rhythm of the rails and paintings both beautiful and authentic, Prairie Train welcomes you aboard the Great Northern for a memorable journey across the country and into the past. 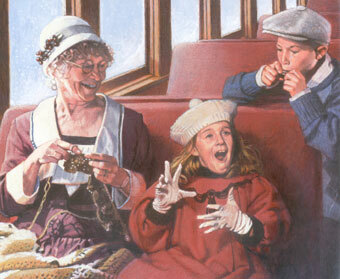 Prairie Train was inspired by Ms. Chall's own childhood train travel and by a bit of family history. Her grandmother was once stranded on a train for three days in a blizzard en route to visit her granddaughter. John Thompson did a wonderful job illustrating my manuscript in a photorealistic style. Some of his paintings are so vivid that the characters nearly jump out of the book! He is a professor of illustration at Syracuse University. His first children's book was Christmas in the Big House, Christmas in the Quarters by Patricia C. McKissack and Fredrick L. McKissack. That book received many awards, including the Coretta Scott King Award. Mr. Thompson has also illustrated O Jerusalem: Voices of a Sacred City, written by Jane Yolen, and Freedom Like Sunlight, written by J. Patrick Lewis. Sometimes fans send photos. I'm honored that this family re-created the protagonist from Prairie Train with such painstaking detail. Kathy wrote: Stirling and his doll, Emily, on the locomative at the Kandiyohi Museum. My mom spent months making things and getting other people to make things so she could assemble an entire Prairie Train outfit for Emily. Qe visited the Great Northern 2523 at the museum on our way home from vacation.